Women are on average 30 percent less likely to be called for a job interview than men with the same characteristics. In addition, gender bias is higher for candidates with lower qualifications than those who have knowledge of an additional language and more work experience. These are the conclusions revealed by a study titled "Are women less likely to get hired?," written by María José González, Clara Cortina and Jorge Rodríguez-Menés, researchers at UPF's Department of Political and Social Sciences. This experimental research consisted of sending fictitious resumes of people between 37 and 39 years of age for 1,372 real job offers in Madrid and Barcelona. The CVs were sent in response to offers in 18 occupations whose degrees of feminization, required qualification and responsibility varied. In general terms, of the resumes considered,more than 5,600, male candidates were called to interview in a higher proportion (10.9 percent) than women (7.7 percent). Under equal terms, the likelihood of receiving a call to a job interview was 30 percent lower for women than for men. The report also analyses the possible differential effect between women and men of having children, as well as preparing for the post. For example, the study reveals that the likelihood of receiving a call for an interview was 23.5 percent lower for women without children than for men in identical circumstances. However, women with children suffer increased discrimination in job recruitment processes, as they face a double penalty: womanhood plus motherhood. Mothers are on average 35.9 percent less likely to be called for a job interview than fathers. Despite the gender differences, the authors point out that discrimination against women persists, but to a lesser extent, when candidates are better prepared for the position than the post requires. That is, gender penalization is lesser if, in addition to what is required, the applicants have knowledge of an additional language and greater work experience. The authors conclude that gender bias in recruitment processes are based on stereotypes about productivity, rather than on prejudice. Employers vary their responses when women have more skills than other similar candidates (such as languages or a solid career or experience in supervisory tasks). 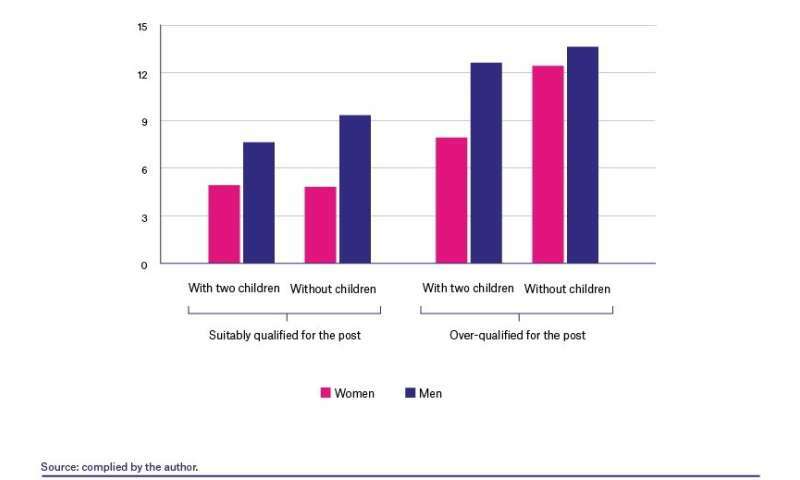 In fact, the data suggest an almost complete absence of discrimination against highly qualified women without children.